Being in my 40s, I think that it is fair that people lump me onto the Tita (Aunty) category since these days I am older than a number of people that I encounter on a regular basis. I know some women don’t like literally being called Tita unless that came from someone close to them but for me, I don’t mind. I think I’ve already pushed on to a higher category of Tita-ness because of my dependence on pain relief rubs. I remember being introduced to pain relief rubs in elementary school, when my grandmother rubbed Vicks Vaporub on my chest and back AND under my nose when I had a bad cold. I think that I’ve never had some Vicks on me whenever I had a bad cold since then. It was also at this age when I was introduced to Aceite De Manzanilla (Chamomile Oil), which was used on me for when I had insect bites and stomach aches. Sometimes Omega Pain Killer was involved too and these days I tend to use that more for insect bites and tummy aches than Aceite De Manzanilla. As I got older, I’ve moved on and tried several other pain relief rubs. I remember using Katinko when an officemate of mine let me have some when I had an awful headache at work. I bought one but I found that it was still too mild for my headaches, so I tried White Flower. While it did work, I felt that the smell was a bit much (read: it makes me smell really old) so I gave that up as well. I also tried those menthol sticks that come in either a small tiny capsule shape or a big fat one, but I quit using that when it melted in my bag that I had left in the car during a warm day – it was such a hassle to clean up! A couple of years back I discovered and got hooked to Tiger Balm. They have the white one for headaches and the red one for muscle pain, but I discovered that both served the same amount of pain relief no matter what type of pain I had so I tend to interchange them depending on how bad I was feeling. The white one is a bit milder than the red, so you know the pain is not as bad if I’m using the white one. A little tip: if your cold has gotten to the point where your lymph nodes and ears hurt, try putting some Tiger Balm just outside your ear then cover it up so that the mist (?) of the menthol goes into your ear. I don’t remember where I read that exactly but for me that gives me instant relief when I have that kind of pain during a cold. Recently, a friend of mine gave me Creations Spa Essentials Pain Relief Rub as a gift. There are four variants, but what I got was the Energy one. I loved it! It works really well without the old person smell that most of these rubs have. Plus, I’ve found that if I put some on the temples of my head before going to bed, I tend to have better sleep in the process. I was so happy with this one that as soon as I discovered that my supply was running out, I bought all four variants as a gift to myself. These days I’m using their Oliva Organica variant and it smells like I just came out of a spa whenever I use it. 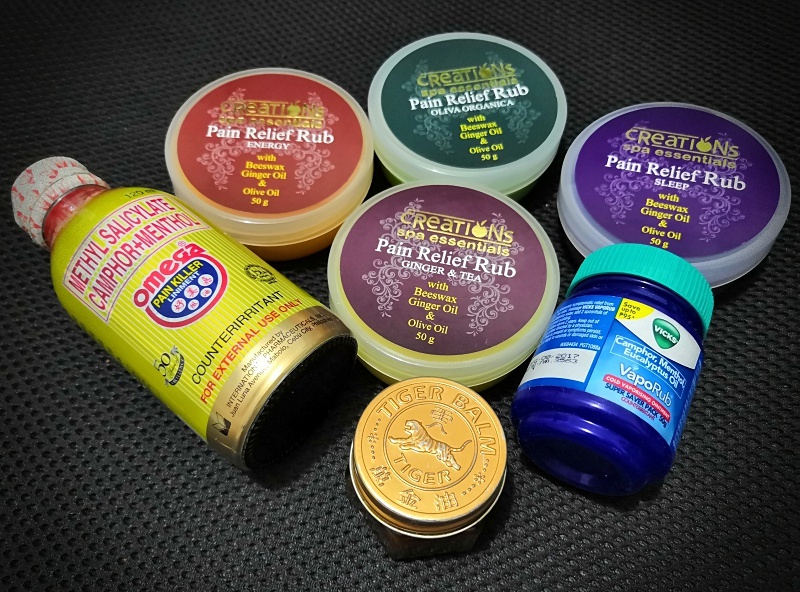 Anyone else out there willing to admit to their Tita ways and share their favorite pain relief rubs with me? I love trying out the other options when I can, you never know when you’re going to need it! I know essential oils are the in thing these days but I still prefer these types of remedies more than that (plus, these ones are less expensive). What do you think?